First ground broken at the farm this season! We’ve got a lot of ploughing and plant sale prepping to do this week, so you won’t see us at the market. 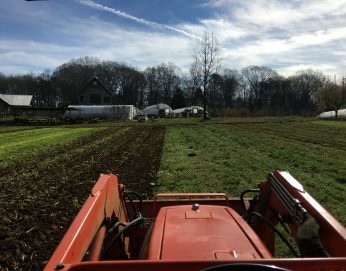 Though we grow vegetables and sell them year round, there always comes a small window – usually 4-6 weeks – in which we “turn over” all our fields and plant them anew. During this window we have nothing to bring to market. We know, it’s sad for our refrigerators, too. Vegetables at market this week: We’re turning all our fields and replanting. We hope to have fresh veggies for market by the middle/end of April. Crabtree accepts cash, checks, credit cards, and EBT.